Trenchless sewer repair is a method of fixing broken, damaged, and leaking sewer pipes without the need for extensive excavation. The process was developed approximately fifteen years ago, and perfected by Nu Flow Technologies with the Nu Flow pipe lining system. Prior to that time, plumbing contractors only had the traditional sewer repair method to rely on. It requires the excavation of a large trench along the length of the sewer pipeline. Once the sewer pipes are exposed they can be repaired or removed and replaced with new pipes. 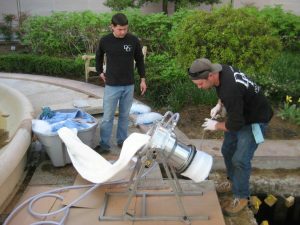 The traditional sewer repair process is extremely time-consuming. It typically takes multiple weeks to complete from start to finish. That means that anyone residing in or working at the property cannot use the water or toilets until the repairs are made. The traditional sewer repair method is also expensive and destructive. When the trench is excavated it destroys anything and everything in its path. That includes lawns, flowerbeds, trees, patios, walkways, driveways, parking lots and everything else that is located above ground where the sewer pipeline runs. Once the plumbing contractor completes the sewer repair work they fill in the trench with dirt and move onto the next job. The property owner is responsible for fixing the destroyed landscaping and hardscaping, which of course adds to the cost of the sewer repair job. The good news is that trenchless sewer repair provides property owners in Edmond, OK a far more cost-effective and significantly less time-consuming choice that does not destroy landscaping and hardscaping. Once the sewer pipes are cleaned and all clogs are removed a small access point is made at one end of the pipeline. A high-tech machine is used to pull a felt liner through the existing sewer pipeline. The felt liner is saturated in a specially formulated epoxy resin. A rubber bladder, contained within the felt liner is then blown up and removed after a short period of time. The epoxy resin cures in place, and once it hardens a brand new pipe is formed. Although it is technically called a pipe liner, most experts refer to it as a pipe within a pipe. The entire process can be completed in as little as a day. Trenchless pipe lining is approximately fifty-percent more cost-effective than the traditional sewer repair process. Although there are various trenchless pipe lining products and services available on the market today, experts worldwide consider Nu Flow Technologies to be the gold standard in the plumbing industry. It is a simple formula. When you incorporate the use of the best materials, most technologically advanced equipment, hire only the most experienced field technicians, and provide them with the highest level of training it is a win-win for everyone involved. As an added bonus, the installation is guaranteed for ten years and will last for a minimum of fifty years. Nu Flow Technologies is proud that our patented and proprietary solutions not only meet but also far exceed the industry standards. In fact, our company sets the industry standards. Please contact us at your earliest convenience to set up a trenchless sewer repair estimate. We are also available to answer any and all questions about the process that you may have.